An entirely unexpected choice, Hawkspar turned out one I regretted - to an extent. But positive reviews of its prequel, Talyn, compelled me to give it a try. 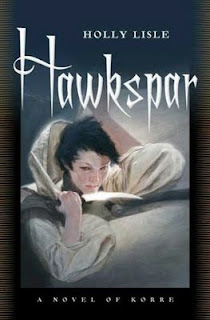 Set initially in a convent - albeit a unique one -, Hawkspar focuses around a young acolyte, whose name, like most there, has been forgotten. However, the Ossalene Order's sanctity dwindles in comparison to its power: for most acolytes within will have their eyes replaced with those of stone, imparting to them extraordinary powers - for a price. And ruling the Order are the Oracle Eyes - final creations, seven pairs of eyes with the ability to sense the currents of time: and first among these equals, Hawkspar, the Oracle Eyes of War. But all is not - quite - as it seems. For some within the order, the past is not as distant as the order's doctrine would mandate - for the acolytes formerly belonging to the Tonk, a fiercely loyal, clannish people, have banded together in a concerted attempt to wield power within the order. Our nameless protagonist is one such, and, initiated into the conspiracy as the choice of the Tonk Oracle - Hawkspar -, her magical call for aid is heard by a slave liberator. It's only unfortunate that this interesting premise - oracular intrigue - takes up so little of the novel, and the "nameless, faceless evil" so much. Apparently, she has seen a large threat to the Tonk, and one that only the Eyes' manipulation of time can prevent. Okay, fair enough. Cliche, but a useful device. But the actual threat bears no connection whatsoever to the remainder of the book, and the resolution of it - and the book - is slightly, well, laughable. It's a deux-ex-machina to the extreme, insipid, and meanders slightly. There are several contradictions paining the novel as well - our protagonist has fallen in love with the slave liberator from afar. Fair enough - they're cloistered, and she's about to be rescued. But he is under the impression that she is a young girl, and for him to suddenly turn around - in internal monologue - and confess to have loved him from the first call is simply a mistake, and repeated as it is, you're forced to wonder about the editing - mistakes profligate. However, although the deux-ex-machina finale is to be avoided, Lisle must be lauded for one aspect: her heroine suffers for her actions. The new Hawkspar Eyes certainly isn't an "author's darling"
I have not heard of this book before. It sounds as there is a lot that is going on here. I like how you pick up what the book is about in the review here. Sorry, it didn't turn out as much for you in the reading. It is nice to see that a character is responsible for their actions. Thanks - I liked the initial concept (scheming between oracles), but disliked the early stereotypical twist. Not much new here, really. :) But thanks!